There’s a lot on the market today when it comes to speakers – you’ll be astonished at the features available. But, don’t get caught up too much in the price, ohms, and physics (your head will be spinning faster than an old turntable on a Friday night). Generally, people who love audio and demand the best only look for a few important features when it comes to speakers – build quality (very important), dynamic range, timbre, size, and bass. Get these five aspects right and you’ve more than likely got a great purchase in the bag. 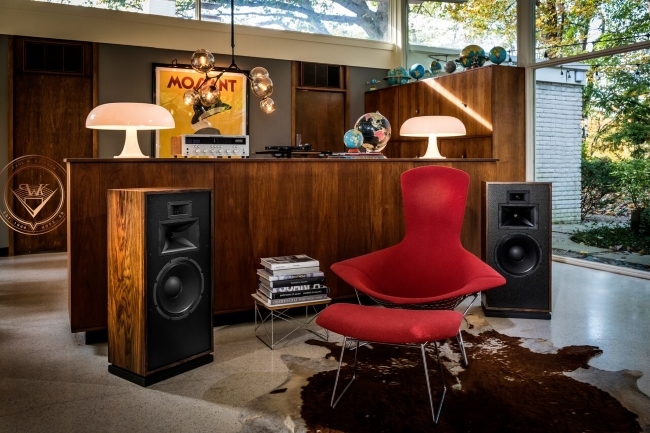 We’re super excited to introduce the Klipsch Forte II Special Edition. Anyone who knows audio knows Klipsch. They’ve been perfecting sound for decades and just never stop producing hit after hit after hit. Since it was first introduced in 1985, Forte wasted no time in establishing itself as the most popular Klipsch model. It stood out head and shoulders above the competition with its sophisticated design and unequalled performance. Models were just flying off the shelves and everyone thought listening pleasure had for sure reached its climax. Now, you can look forward to all the original charm and charisma of the Forte, but with updated cosmetics and the absolute latest in acoustic engineering advancements. Music to our ears! To make the re-introduction of the Forte II one never to forget, Klipsch is offering two special edition versions using high-end finishes and custom grill treatments – and only 70 pairs will be made of this Special Edition Forte featuring a matte black finish and silver lustre grill cloth. It’s a high efficiency, full-range speaker. Limited-edition matt black finish and silver lustre grill cloth (yip, limited edition). Only 70 pairs made (worth repeating). Special edition plaque hand-signed by the craftsmen. That makes it a real collector’s piece for anyone serious about audio. Designed and made in the USA with domestic and imported components. 15″ passive radiator for full range performance. Book-match wood veneer sold as grain-matched pairs. Serious audiophiles who want to turn their friends green with envy and crank up their listening pleasure to serious heights are in for the ride of their lives with the Klipsch Forte II Special Edition. Like most other things, speakers are about personal taste. How you want to experience your audio is entirely up to you, so come talk to us about the Klipsch Forte II Special Edition. This entry was posted in Klipsch. Bookmark the permalink. ← Be the Prophet of BOOM!